Last night seven million US viewers watched a Californian single mum, who'd never cooked lobster or venison before, win the role of Head Chef at London’s Savoy Grill when it opens in October. 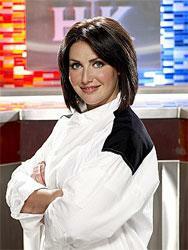 Holli Uglade beat off 15 rivals to secure the key role at Gordon Ramsay Holdings. If you’re stuck in London, while the rest of your office is away, texting you pictures of themselves on some palm-fringed beach, be heartened to discover there are some benefits to being in town. For example, you’ll be the only one who knows to get on the phone at 10am sharpish this Friday to book yourself a seat at one of the soft opening of Polpetto. London may have 47 restaurants worth of a Michelin star or three, but according to the latest copy of the Good Food Guide it merits just 14 spots in the Top 50 restaurants in the UK, with just one - Gordon Ramsay at Royal Hospital Road - squeezing into the Top 5. It's a good news day for Gordon Ramsay - looks like any money worries might be a thing of the past with the news that Ramsay could be taking home a hefty wodge after the sale of his half share of TV company, One Potato Two Potato. The gourmet food truck craze that’s exciting foodies from Los Angeles to New York is crossing over the pond to London. Pearl chef Jun Tanaka will take to the streets in an airstream kitchen as part of the London Restaurant Festival this October. I have to make something clear at the outset. I live VERY close to Trullo - about 3 minutes walk away. Some weeks ago I found myself regularly passing the creation of a new restaurant on the way to the office and, naturally, was intrigued. The Langham launches "world's coldest martini"
A drink billed as "the world's coldest martini" easily grabbed Hot Dinners' attention, so last night we jumped at the chance to test out the Langham's new groundbreaking cocktail. Read more: The Langham launches "world's coldest martini"
With the much-delayed Savoy hotel launch getting closer, all eyes are now on Gordon Ramsay to see what he can pull off for the formerly much-loved Savoy Grill. While Roux at Parliament Square has had some mixed reviews since its opening, most of the criticisms were aimed at the décor and design as opposed to the cooking itself. So it was a surprise to hear that head chef Daniel Cox is already moving on after only 10 weeks. A replacement is yet to be announced, and time will tell if the new chef decides to revamp the restaurant as well as the menu. Taking a leaf from the American food movement Outstanding In The Field, Harvey Nichols restaurants across the UK will be taking diners out of the city and into the countryside to eat food where it's produced, on the farm. Hot Dinners was over at Westfield last night for a celebratory glass of Pommery champagne (or two) in honour of the opening of an extension to the Searcy's Champagne Bar. Recession - what recession? The place was packed with fashionistas - and the odd foodie - cheered to find a comfortable area to charge their glasses with fizz. Tickets go on sale today for this year's London Restaurant Festival Gourmet Odyssey tours. There are four tours to choose from on Saturday 9 October 2010, and for your £135 you get a glass of Mumm chamapagne in the Met Bar to start and then visit three restaurants in turn for a starter, main course, dessert and accompanying wines. Hot Dinners was full of the festive spirit (and food) last night when we attended the Christmas launch for Waitrose in Fitzroy Square. While it was rather surreal checking out the latest gifts and party food for December in the middle of July, what we were mainly looking forward to trying was some of the new Heston Blumenthal range of food developed exclusively for the supermarket.